It is common for testing to be given constraints around schedule, budget, team members/skills, and even tools. [Relief] Finally! I am going to get more people, better tools, and we are going to do this thing right! [Defensive] What we did last time worked fine, didn’t it? Didn’t it? [Cynical] You are just going to cut whatever I number I give you by 30% while holding me to my original effectiveness targets. [Disbelief] Is this a trick? You really want to know? Or, depending on the company and its philosophy toward quality, you may experience the opposite; every project you are being asked to improve, to be better than last time. In either case, you are being asked to stand and deliver: increase testing capability and coverage, reduce turnaround time, find those important defects earlier, etc. 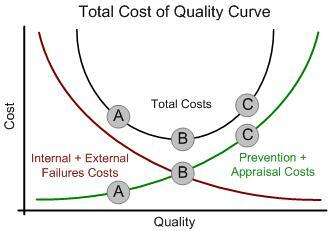 Let’s assume that “good enough” quality can be interpreted as “sufficiently valuable or fit-for-use”. The project wants to reach this goal for its system or product as quickly and as cost efficiently as possible. How can testing help? Option A – I Choose You? When you create your options, start by considering the basic three: A-Light (quick and dirty), B-Balanced (thoughtful), and C-Heavy (overkill?). One of the crucial components to being “smart” in a constrained situation is to be able to correctly decide or select which things are “must-haves”, which are “should-haves”, and which are “nice-to-haves”. How you sort these things depends a lot on what is your appetite for risk and what you are willing to pay. 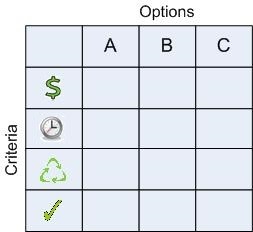 To make the trade-offs clear to stakeholders, we can create options for testing as business cases and place them on the Total Cost of Quality curve. 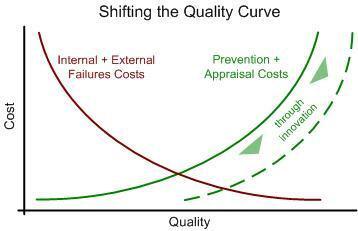 Another dimension to “smart” is innovating in order to shift the quality curve to the right, thereby maintaining or reducing the overall cost while increasing quality. With “smart options” based on quality criteria, risks, and project constraints in front of stakeholders, useful discussion is possible. Choices can be made with awareness of the implications in terms of trade-offs or opportunity costs. Note: In creating your options, you are really trying to find the “right-fit” option. Therefore, any initial option can be “looted” for pieces to be merged with others on the way to creating that final, agreed, right-fit approach. It is a very human tendency not to change until it becomes more painful to continue with the status quo than to finally make the needed change. Then of course, something has to be done, and fast. Et voilà! Today’s testing approach will meet the needs of today’s project, and in a more efficient and effective way than yesterday’s – The smart(est)-fit for the right now. This entry was posted in All, Business of Testing, Planning for Quality, Risk & Testing, Test Planning & Strategy and tagged process improvement, risk driven, ROI, software testing, test management, value add. Bookmark the permalink.